A 5 mile walk from Mile End tube station (Central, District and Hammersmith & City lines) to Bromley-by-Bow tube station (District and Hammersmith & City lines). The route can be shortened by finishing at Devons Road DLR station. Opposite is Onyx House by Piers Gough. This replaced a 1938 Odeon cinema which was built on the site of the 18th century Essex House. Gough also designed the 'Green Bridge' which allows nearby Mile End Park to span the main road. At the end is Holy Trinity Church of 1834-9 by Daniel & James Austin. Damaged in the Blitz it was closed in 1984. A number of sea captains are buried in the churchyard which closed in 1853. Adjacent is the Central Foundation School. 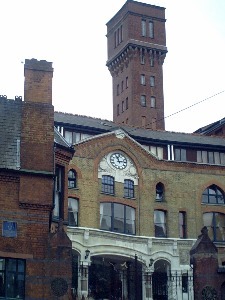 This was built in 1909 as Coopers' Company Boys School on the site of Stepney Grammar School. This was named after the landowner Sir Charles Morgan of Tredegar. The houses were built in 1828 and the north side refronted in the 1830s. St Clement's Hospital was opened as the City of London Union Workhouse in 1849. It became an infirmary in 1874 and was expanded as a hospital by the LCC in the 1930s. Some parts were bomb damaged in WWII. The former Coborn Girls School was built in 1897-8 as a successor to a charity school founded by the will of Prisca Coborn in 1701. The Central Foundation School moved into the building from Spital Square in 1975. On the corner with Harley Grove is a memorial to George Lansbury, twice Mayor of Poplar and leader of the Labour Party 1931-5. It stands on the site of his house which was bombed in 1944. On the other corner are the former offices of Spratts (dog biscuits) used 1939-64. Phoenix School stands on the site of Bow Open Air School, destroyed in WWII. At the end the former chapel of 1854-5 is now a Sikh Temple (1979) having served as a synagogue from 1927. The primary school was opened as an open air school in 1928 by the LCC. The maternity clinic of 1927 is now a chest clinic. Wellington Buildings were constructed in 1900-1 to house people displaced by the railway. The buildings on the corner of Alfred Street were built in 1924 as electricity showrooms with flats above. There is a memorial clock to Minnie Lansbury, the daughter-in -law of George Lansbury. She was imprisoned as a suffragette and a councillor (see resources) and died aged 32. Bow Road Station was built in 1902. Joseph Westwood, a shipbuilder lived in Tredegar House in the 1860s/1870s. It was rebuilt in 1911 by Rowland Plumbe as school for nurses from the London Hospital (closed in the 1970s). The Police Station on the corner of Addington Road was designed by John Dixon Butler in 1903 and has stables and married quarters (added 1930s) to the rear. The Magistrate's Court of 1990 opposite replaced an 1860 courthouse. The bookmakers just beyond the railway is a former station building (1869) of the Blackwall extension of the Great Eastern Railway. Beyond Bow Church DLR Station (opened 1987) is the (haunted) Bow Bells pub. Bromley Public Hall was built in 1879-80 as the vestry hall for St Leonards and extended in 1904. Next door is a former police station of 1859. The Poplar Town Hall opposite was built in 1937-8 by Culpin & Son and replaced Bromley vestry hall. There are mosaics on the entrance canopy and relief panels depicting workmen on the corner by David Evans. Number 2 was the rectory of 1898. The May Fair was held here after its removal from the West End in 1764 (replaced by the school in 1876). The area was developed for housing from the 1820s to 1860s (west side). On the right is the entrance to Grove Park, originally the grounds of the late 17th century Grove Park Hall (demolished in 1909). Beyond this is Bow Bus Garage, built as the LCC's tram depot in 1907-8 and extended in 1910-11. The Bryant & May match factory was founded in 1860. Warehousing and offices were constructed in 1874 and the factory built in 1909-11. The Matchgirls strike was organised by Annie Besant in 1888. Production ceased in 1980 and it has been converted to luxury apartments and re-named Bow Quarter (sadly now a 'gated ghetto'). Return to and continue along Bow Road towards the church. The present convenience store was built for Stratford Co-op in 1919 (see beehive on pediment). The RC church was originally the chapel for the convent next door, founded in 1866. The convent building is now home to the Bow Arts Trust. St Mary's Church was built as a chapel of ease after 1311 and largely rebuilt in the 1490s. It became a parish church in 1719. Proposals for rebuilding were shelved for lack of funds until 1896 when the chancel roof collapsed. The reconstruction was supervised by SPAB to retain much of the old fabric. C R Ashbee's Guild of Handicraft provided the metalwork and designs for the new vestry. It has some interesting memorials and was restored after bomb damage by Goodhart Rendel. There is a statue to WE Gladstone in the grounds which was donated by Theodore Bryant. Cross into Bromley High Street and go right into Rainhill Way. Opposite the rear of the Register Office go into the cul-de-sac (Priscilla Road). The Drapers Almshouses were built in 1706 for 12 poor people with additions in 1836. The site was purchased by the North London Railway in 1867 when the east and west wings were demolished. The remaining buildings which had become derelict were restored by the GLC and a housing association in 1982 and are now private houses. On the corner of St Leonard's Street is the former Seven Stars pub, an 1895 replacement of an older building. On the opposite corner is the memorial gateway to George How, Dean of Stepney (1840-93). The mid-19th century church of St Mary with St Leonard (built on the site of a priory) which stood on the site behind was demolished after war damage. A notice says it is an 'Adventurous Playground' whereas it looks to be an unappealing wasteground! There is a memorial on Old Palace School to 36 firemen killed in 1941 when the building, which was being used as a sub-station, received a direct hit. Further along is the Bromley by Bow Centre, designed by Wyatt MacLaren. New buildings and the former Congregational church and hall provide community facilities including a health centre. There are also workshops for craftspeople and a cafe (open to the public). The 18th century arch, designed by William Kent, came from Northumberland House. This was laid out by the LCC in 1900 on the site of Tudor House. It has been re-landscaped and includes tiled motifs, made by local children, in the path. It is named after Robert Grenfield, a popular park keeper. Kingsley Hall was set up by Muriel & Doris Lester in 1915 to provide educational and recreational facilities for local people. During WW1 it maintained a pacifist stance and in 1918 developed links with the suffragette movement. In 1926 it became a soup kitchen for families of men involved in the General Strike and in 1936 provided accommodation for the Jarrow Marchers. The present building was designed by Charles Cowes Voysey and opened in 1928. It has a plaque to Gandhi who stayed there in 1931 and a new Peace Garden. Houses here were built in the Victorian period (several are dated). The Children's Nursery (established in 1912) was built in another building by Voysey in 1923 on the site of stables and opened by HG Wells (plaque). Beyond the railway on the left was St Andrew's Hospital. It opened in 1871 as the Poplar & Stepney sick asylum, south of the union workhouse. It was demolished in 2008. The site of the park was previously a railway yard. Three pieces of masonry found during construction have been retained. The Widow's Son or Bun House pub maintains the tradition of saving hot cross buns for a son lost at sea. The flats have a memorial to Clara Grant who taught at Devons Road School (since renamed after her). She also opened the Fern Street Settlement to provide assistance to local people. It was bombed in WWII but its replacement still serves as a community centre. The Poplar guide of 1927 (see below) describes this road as having Pratts Motor Spirit Co, Anglo-American Oil Co, council Electric Light Works, Disinfectant-producing Depot of public health department, Open Air Swimming Bath and LMS Railway goods depot. Ahead the former premises of Spratts have now been converted to housing. At the Limehouse Cut you need to go left (eastwards) so go down the steps and walk to the right (going under the railway). This is part of the Lea Valley Walk. Continue along the railed boardwalk going under the road. Cross over Bow Locks via the ramp and continue to follow the path between the river and the canal. Go right onto Three Mills Island. The House Mill on the left was constructed by Daniel Bisson in 1776 but rebuilt in 1802 following a fire. The Clock Mill on the right dates from 1753. Ahead the old distillery buildings are now in use as film studios. Go back along Three Mills Lane to the Tesco store then left along Hancock Road continuing along the main road. Use the subway to cross to Bromley-by-Bow tube station.